Stewardship Reflection on Lectionary Readings: March 31, 2019 - Catholic Stewardship Consultants, Inc.
For too many of us, Lent is a season of doom and gloom, a time to feel bad about all the ways we are not “measuring up” in our spiritual lives. But this view could not be further from the truth. Lent is a season of refreshment and love, of awakening and rebirth. In fact, the word “lent” comes from the Old English word, “lencten,” which means spring. Lent is intended to be a springtime for us in our spiritual lives where all can become new again. St. Paul tells us in the Second Reading today, “Whoever is in Christ is a new creation: the old things have passed away; behold, new things have come. 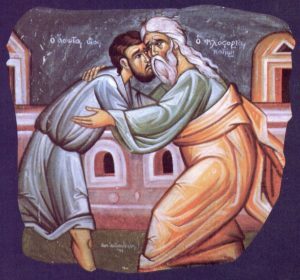 And all this is from God, who has reconciled us to himself through Christ.” The Gospel Reading, too, is filled with this theme of awakening and the extravagant, life-changing love that the Father has for each one of us; it is the well-known parable of the Prodigal Son. We are all familiar with this amazing story — the bratty younger son who has the audacity to ask his dad for his inheritance early, only to squander it sinfully away. It makes us bristle instinctively at his nerve when we read it. But isn’t that exactly what we do when we selfishly turn away from God (in big or small ways) in our own lives? We squander away the inheritance of grace He has given us. In desperation from the mess he had made of his life, the son finally “comes to his senses”—awakening to the truth that he is a beloved son of a loving and merciful father and decides to return home. His contrition is faltering and imperfect and seems motivated in large part by his growling stomach. But it was enough for the loving father. “While still a long way off, the father caught sight of him.” The son was still a long way off from a deep understanding of what he had lost and what he was about to gain. But that small and imperfect openness to the father’s love was enough. In fact, the father is “filled with compassion for him” and immediately sets about preparing feast and fine clothes for this son. What an extravagance of love! What a beautiful picture Jesus gives us of our Father’s love and mercy. Oh, how this should fill us with gratitude for such a Father! Be refreshed in this love. We are new creations thanks to this reconciling love. And what comfort this passage gives to those of us who watch with sorrowful hearts for a return to faith for own “prodigal” loved ones. Our Father is watching and waiting for their return to Him even more eagerly and patiently than we are. We owe God everything! But let’s start by giving him one little thing. Take even a faltering step closer to Him — go to confession, join in the Stations of the Cross, call a family member or friend you are at odds with and try to reconcile. With just the tiniest bit of spiritual “spring cleaning” we can be sure we will be swept up in our Father’s loving embrace and find ourselves feasting in His presence. That is what lent is all about.